My Problem Areas: Oily skin. Breakouts. Irritated skin, especially by harsh face washes. I actually used a Face Wash yesterday that I bought some time ago from Lidl, and I know I hate my oily skin, but this one just dried it out so much that it felt absolutely awful, even after I had moisturised. What I was looking for: Over the past few months, I've become very aware of oil-free products that are non-comedegenic, meaning that they won't clog my pores with crap/oil/harsh chemicals etc. So, I've been browsing the market to find out what different types of oil-free products there actually are out there, and I have to say that I've been amazed at how much there is. Ultimately, I want to move towards changing my Skin Care Regime completely, so whilst I already have a Neutrogena Oil-Free Moisturiser, which I reviewed back in April, I was looking for a Face Wash, Cleanser, Toner and Eye Make Up Remover that were all oil-free, ensuring that my skin is looked after, rather than clogged up by products that don't suit my skin type. 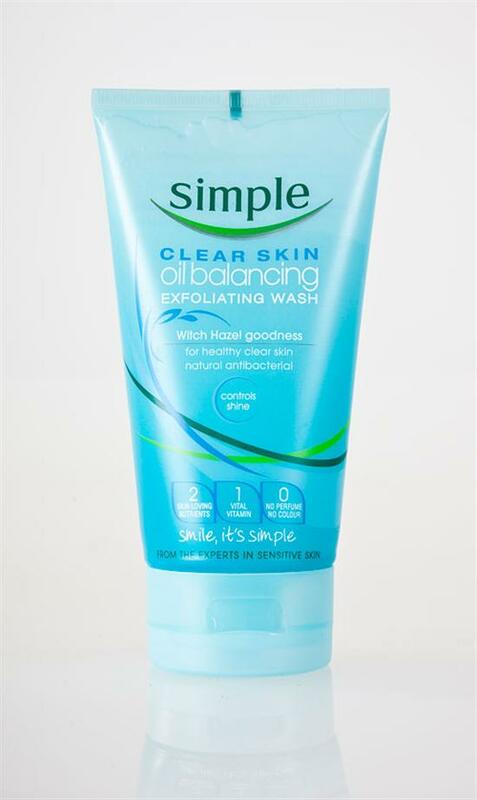 Why I chose the Simple Range: Well, as regular readers of my blog might remember, on my quest to find the best Oil-Free products for my skin, I picked up some Simple Oil-Balancing Cleansing Wipes (for more details about why I chose Simple more specifically, check out the review for the Wipes! ), and following that discovery, I loved the wipes so much, that I decided to try out something else from the range, and since I needed a Face Wash, I ended up buying this one! Did it Sort out my Problem Areas: Funny thing really. After I first used this product, a couple of weeks ago, I turned to my boyfriend and said: "Wow. So this is what it's like not to have greasy skin..." I should probably also have said "...or really dry skin", since with nature and harsh products, there never appears to be a suitable middle ground. But, this Face Wash left my skin feeling absolutely amazing, and I just couldn't believe it. I never thought that I'd ever be able to find a Face Wash that would be consistently good, because so many Face Washes in the past, have been great on first use, but seem to lose a certain quality after a while. With Simple's Face Wash, however, every time I use it, I seem to get the same result. So, I am very happy to say that yes, it did sort out my problem areas: My skin is not greasy, I haven't had any major breakouts, and my skin definitely doesn't feel irritated. Any Downsides: As usual. The price. It's £3.99 in most places, although Simple seem to always be on offer somewhere or other, if you're willing to shop around. I actually bought this from Boots, but I've since found it in a 3 for the price of 2 offer in SuperDrug. But, most of the best Face Washes are around this price, so it's not really a huge deal. When it comes to Simple products, a lot of people complain about the price, and I think it really is a case of shopping around. ASDA appear to be cheaper than most places for getting products like this, but I recently found a lot of Simple products being sold for around £1 in a branch of Savers, in Sheffield. In fact, my mum bought some Oil Balancing Cleansing Wipes for £1 from that Savers, so I was pretty impressed. I haven't seen if my local Savers sells them cheap, but fingers crossed!